The presentation at Bicker Preparatory School. Youngsters at Bicker Preparatory School have presented a cheque for £600 to the emergency medical charity LIVES (Lincolnshire Integrated Voluntary Emergency Service). 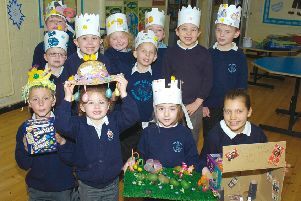 The money was raised through donations from parents and friends of the school. The cheque was presented to Gordon Kirk, who had previously come to talk to the children about LIVES and the work of the organisation. His visit also saw the children learn some first aid skills from him. President Barbara Craven welcomed members and guests to the February meeting of Boston Ladies Probus, held at Merrimans Restaurant and Lounge, near Boston. Attendees heard tickets are available for morning coffee at Johnsons on Tuesday, March 12. The ticket price includes a hot drink and scone, and a talk about house plants. The president announced that the annual membership fee for next year will be increased to £25 to reflect the increase in fees paid to speakers. The monthly meal will increase to £12.50. Next month will be the Annual General Meeting and handing-over meeting, and the President reported that more volunteers are needed for the committee as the constitution states that there should be nine committee members. Mary Hewitt gave the Probus toast and grace. Following the lunch, the president welcomed guest speakers Kelvin and Sarah McKenchie Green, local bee keepers. Members enjoyed an informative talk, supported by slides and a film, and a demonstration of equipment including a bee hive. Members also took the opportunity to purchase locally produce honey. Barbara Craven gave the vote of thanks. Next month’s meeting will be held on Wednesday, March 20. Vice president Rob Goodale opened the February luncheon meeting of The Mayflower Probus Club of Boston at The Boston & County Club with a warm welcome to all members. He also welcomed back Probian Ray Johnson after a recent spell of ill-health. A presentation was made to Probian Alan Dunnett in recognition of his many years service to the club in a variety of roles. Grace was said by Ray Harding. Events organiser, Arnot Wilson distributed a detailed programme of the numerous events planned for the coming year which members were advised to study and make early reservations. The first of these is the club’s informal Sunday lunch on March 17. Bookings for this are required by Monday, March 11. Members heard there are still a few vacancies available for the holiday trip to the Isle of Wight between Wednesday, July 17 and Sunday, July 21 and early applications are required. The expected speaker from the Royal National Lifeboat Institute was unable to attend and Probian Tony Hall stood in at very short notice. He gave an interesting and informative talk on the planning and construction of John Adams Way. The vote of thanks was proposed by Derek Howard. The next meeting will take place on March 14. The Lincolnshire branch of The Corps of the Royal Electrical and Mechanical Engineers (REME) holds its Annual General Meeting at the Drill Hall, in Main Ridge West, Boston, on Tuesday, March 5, at 7pm for a 7.30pm start. Attendees can expect to find a bar and buffet, plus banter. All serving and past members of REME are welcome. The Rotary Club of Boston has reported its latest annual ‘Tesco Trolley Challenge’ has raised a record sum for good causes. The main beneficiary this year is the South Lincolnshire Domestic Abuse Service (formerly Boston Women’s Aid), a local charity which has been providing specialist domestic abuse services for almost 30 years; it has received £1,000. The charity gave its thanks to the club. The club, meanwhile, paid tribute to ‘the generosity of Tesco and its customers’ in achieving the record sum. Hundreds of pounds have been awarded to projects near Boston through East Lindsey District Council’s Councillors’ Community Grants Scheme. - Friskney councillor Carleen Dickinson has awarded £250 to Friskney Parochial Church Council to help purchase and install CCTV. - Halton Holegate councillor Jim Swanson £200 to East Kirkby Parish Council to help purchase an information board. Anyone interested in applying for a grant should contact their local district councillor to discuss your project. Chairman Arthur Gold welcomed nine new members to the fortnightly meeting of the Gosberton Good Companion’s Club in the Public Hall on Tuesday afternoon. Arthur, with Les Stevenson called the bingo. A raffle was organised by Lilian Crunkhorn and Irene Hunter. Les conducted an auction, with Maxine Dobney and Chris Edwards as the runners. Tea and coffee were served by Les Stevenson and helpers. The World Day of Prayer service for Gosberton and district and the Glen Group is at St Bartholomew’s Church, in West Pinchbeck. It will take place on Friday, March 1, at 2pm. Motorists are warned of roadworks in Six House Bank. This year’s service has been prepared by the women of Slovenia. Refreshments will follow the service and there will be a bring and buy stall. Following the success of the last prize bingo, another one is being organised in the Gosberton Public Hall on Friday, March 16, at 7pm for a 7.30pm start. Admission is free. Refreshments will be available at a small charge during the interval . All are welcome – email gosbertonpublichall55@btinternet.com, call 07935 906341, or just turn up. There is a service of Holy Communion and the imposition of ashes in the church of St Peter and St Paul’s at 7.30pm on Ash Wednesday, March 6.